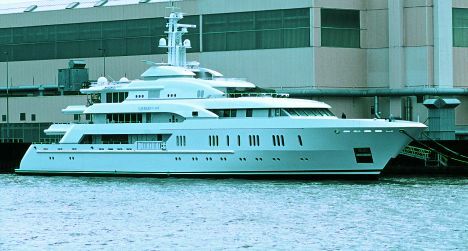 Last June 12, the 72.60 m motoryacht, "Queen M", was delivered to its owner by the German firm Lürssen Yachts. She is now ready for her first excursions in the waters of northern Europe. The "Queen M" has 6 decks and is decorated in contemporary style (the work of interior designer, Donald Starkey). The hull and exterior lines, on the other hand, were designed by Espen Oeino. Built in order to undertake very demanding cruises, the "Queen M" is able to sail 5000 miles at a speed of 12 knots without needing to be re-supplied. Moreover, the abundant onboard accessories mean that she can sail for long periods of time in total comfort and absolute safety. The contemporary style has been used for all areas on the boat and, for a touch of originality, wooden panels can be mounted on the windows, giving her the classical soft lighting typical of Japanese residences. Onboard entertainment is ensured by the plasma TVs installed in all the cabins and by the complex multimedia systems. The crew quarters are located on the lower deck and consist of a total of 12 cabins for 20 people. There are also two guest cabins on the lower deck and a sauna/massage area. Below the waterline, there is a fitness area for the crew, a large cold-storage unit and a laundry area. Far astern, the garage for the tenders, large enough to house a 7.5-m Nimbus Max II and an 8.5-m Serenella Venetian, a custom-built Venetian water-taxi. The main deck features six guest cabins, of which two are for VIPs; the remainder are equipped with separate beds. Naturally, each cabin has its own bathroom. Still on the main deck, we find the lift connecting all six decks, a very luxurious, stylistically original separate dining area, a large galley and a generous saloon, fitted out with a piano bar, hideaway plasma TV and piano. Up on the upper deck, we find an informal saloon, an office for guests, games table and cocktail cabinet. On the open deck, on the other hand, an extension houses a dining area seating 16 and yet another bar corner. The forward area on this deck is set aside for the steering station and the captain's cabin. Moving up another level, we reach an area entirely dedicated to the owner where we find, in addition to an enormous cabin with en suite bathroom and dressing room, an exterior area astern equipped for sunbathing and outdoor meals and, forward, a jacuzzi surrounded by a cushioned sunbathing area. The sixth deck has ample space for more tenders and an exterior fitness area for the owner. For further information: Lürssen Yachts, Zum Alten Speicher 11, 28759 Bremen, Germany; Tel. : +49 4216604166; Fax: +49 4216604170; Website: www.luerssen.de; E-mail: yachts@luerssen.de . Construction material: steel (hull) and aluminium (superstructures).